Wonderful wispy clouds in a morning bright sky. 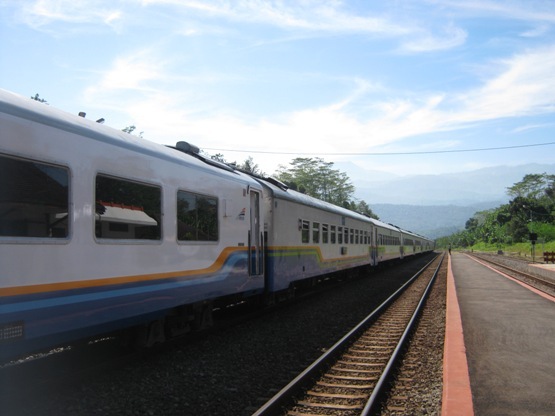 Taken from a small railway station in my husband’s hometown (Bumiayu, Central Java Province, Indonesia). And lovely, wispy clouds they are indeed, Lina!! Wonderful capture for the day and thank you, as always for stopping by my blog and for your kind words!! Have a wonderful weekend!! That's a lovely sky ! That looks like a nice and friendly sky, good for traveling. Excellent picture, nice! exquisite sky! That is a very pretty sky, and I love seeing the train in the photo. Peaceful wispy clouds and a nice depth of field!